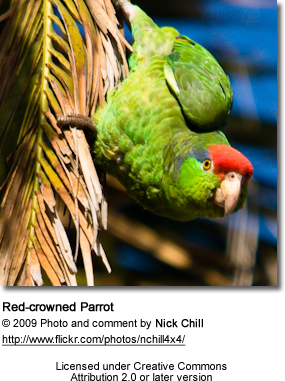 Also refer to: Red-topped Amazon Parrot (Amazona dufresniana rhodocorytha) as it is also referred to as "Red-crowned Amazon Parrot." 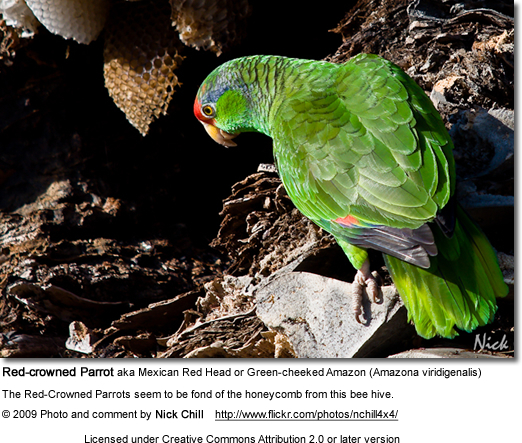 The Red-crowned Parrot - also known as Mexican Red Head Amazon or Green-cheeked Amazon (Amazona viridigenalis) - is an endangered Amazon parrot native to the lowlands of North-eastern Mexico to Northern Veracruz. The current population of between 3,000 and 6,500 is decreasing. The main threats to its survival are the illegal export of trapped birds from Mexico to the USA, and the destruction of habitat. This species was introduced, and now populates, urban communities of southern California with mature trees. 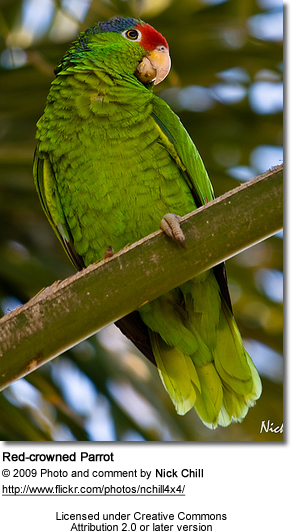 The exact point of introduction of many wild parrots and conures has been the subject of urban legends throughout the state. They gather in large flocks being noisiest in the morning and evening. The characteristic screeching heard of these birds usually occurs when traveling en masse to new feeding areas. Green-cheeked Amazon (Northeast Mexico). The average clutch size consists of 4 eggs, which are incubated for about 28 days. Their diet in the wild consists mainly of seeds, fruits, berries, flowers and nectar. 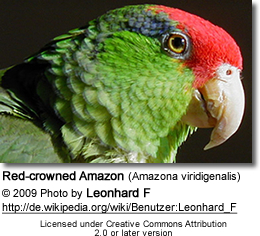 The red-crowned amazon parrot averages 12 to 13.2 inches (~ 33 cm) in length (including tail). 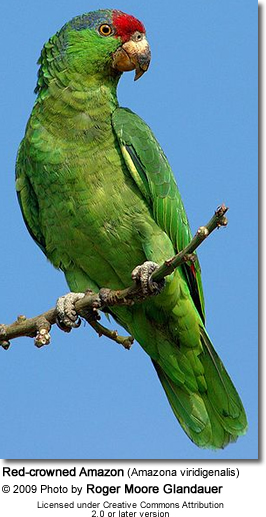 Their plumage is generally green with the most notable features being dark blue streaks behind the eyes, a bright red forehead and crown with light green cheeks. Their forehead, crown, and lores (the regions between the eyes and bill on the side of a bird's head) have red feathers. There is a violet blue band from above their eyes to their neck -- this blue band is absent in very young birds. The beak is yellowish-horn colored and their feet pale grey-green/brown. 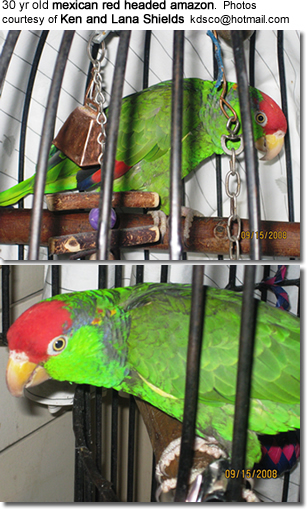 Red-crowned Amazons are often kept as pets and are very affectionate and playful - provided they are given the attention they need from their owners. Although some are excellent talkers, they are best at mimicking sounds. Amazon ownership generally presents multiple challenges, such as excessive chewing - especially at certain stages in their life. They do discover their beaks as method of "disciplining us" once they are out of the "baby stage" and they can generally be somewhat naughty, and it really is important to learn to understand them and to guide their behavior before an undesirable behavior has been established. Aggressive behavior is especially common in "hormonal" amazons. Undisciplined amazons will chew on electric wiring potentially causing house fires. They regard anything in your home as a "toy" that can be explored and chewed on; destroying items that you may hold dear or are simply valuable. Even a young bird that has not been neglected and abused requires proper guidance; this becomes even more challenging when it involves a rescued bird that may require rehabilitation.